Math concepts are skills that build on each other. For your child’s educational success it’s important to engage them in fun pre-kindergarten math games that will begin to develop foundational math skills. 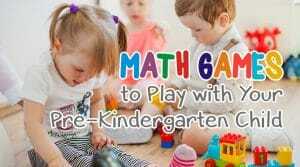 Hands-on pre-kindergarten math games can help your child learn the essential skills needed for kindergarten. Dairy Road Discovery Center understands the importance of early education for preschoolers, and we are here to help! Here are some great pre-kindergarten math games that you can use to make learning fun and exciting. Playdough is an excellent tool that adds fun to early education. Start with a variety of colors to help children learn to identify and name colors. You can print colors on a piece of paper or divide the playdough into two sections. Have your child practice matching the colors to each other. This activity contributes to learning how to explain relationships between objects. Read more about the importance of matching here. This counting and number activity requires a die, a dot marker, and a printed page with coordinating numbers from the die. As your child rolls the die, they find the matching number on the printed page and dot the correct number. This game can be adapted for multiple players, taking turns and dotting the corresponding numbers with different colors. Once the page fills up, children can count how many dots each player marked. This activity requires a tape measure and building blocks. Attach the tape measure to the wall (2 feet should be sufficient), and challenge your preschooler to stack the blocks in a variety of ways. You can ask them to stack the entire way up or choose a particular measurement as a goal. Measuring can help your preschooler to practice patience and fine motor skills for a gentle touch in a fun way. They will also begin to understand the concepts around different sizes. A two-inch tower is shorter than a four-inch tower. Cooking requires measuring and counting and is an excellent way to apply math to an everyday activity. If you are making cookies, have your child add the ingredients and count along with you. If you need two and a half cups of flour, use the half cup measuring cup and count together as you add five half cups of flour. We offer a variety of options for your preschooler. If you are interested in our pre-kindergarten, VPK, or before and after school care programs, give us a call at 321-951-4457 or click here to contact us today. We are happy to answer all your questions and schedule your tour.